Here, we have excellent quality historically accurate and fantasy style medieval and renaissance clothing. We have renaissance doublets and vests that we be an addition to your medieval wardrobe. Our jerkins and tunics styles achieve the look or character you are going for, whether it be Peasant, Knight or Noble. Whether you prefer Breeches, full length pants or a Kilt, you will find it here. Our medieval style pants, breeches, fencing pants and Scottish Kilts go great with all of our shirts and period footwear. We have Scottish kilts made in quality leather like the Gladiator skirt to give you that roman solider look. Appropriate for SCA, LARP, Weddings, Renaissance Festivals, Theater and more! We have knight surcoats, peasant shirts, swordsman shirts, doublets, medieval vests, codpieces, hosen and tights, jerkins and tunics are great for weddings and parties! Please note that the colors used for the Historic Flax will be more subdued that for Modern Cotton, thus making them even more accurate. We hope you enjoy this new feature. 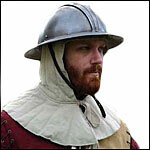 Padded Jacks were widely worn during the Middle Ages by archers, crossbowmen and foot soldiers.